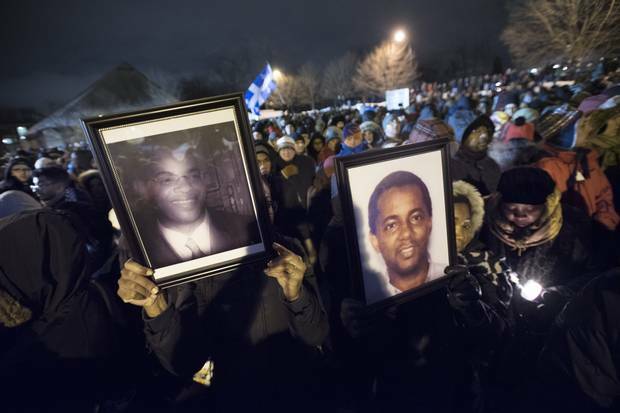 Rosa Pola, left, holds up a photo of Mamadou Tanou Barry and Aissatou Cisse holds up photo of Ibrahim Barry (no relation to Tanou) during a vigil in Quebec City on Jan. 30, 2017. Six people are dead after a mass shooting at a mosque in Quebec City’s Sainte-Foy neighbourhood on Sunday night. The victims were parents, civil servants, academics: men who had left their countries of origin seeking better lives in Quebec. 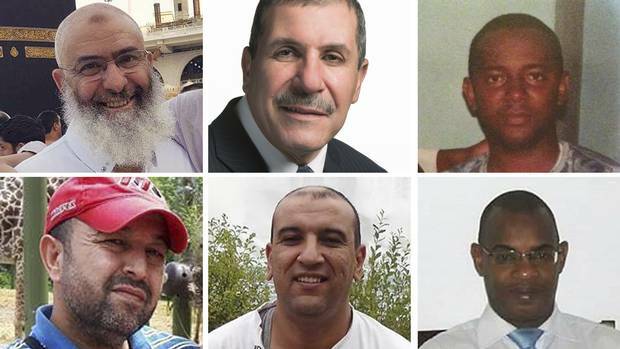 Funeral services were held in Montreal on Thursday afternoon for three of the six men: Abdelkrim Hassane, Khaled Belkacemi and Aboubaker Thabti. A second gathering in Quebec City on Friday honoured Mamadou Tanou Barry, Ibrahima Barry and Azzeddine Soufiane. Canadians have donated thousands of dollars to support the victims’ families. 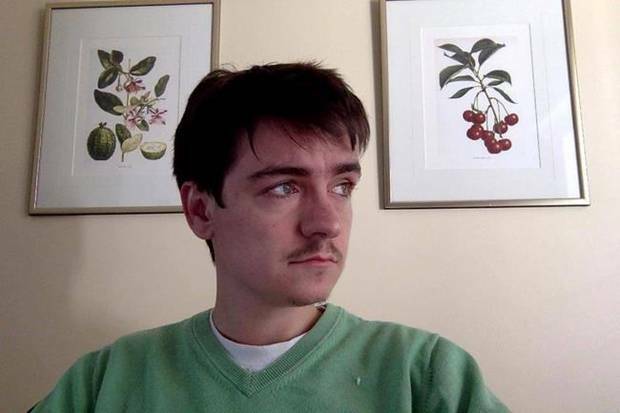 The suspect is Alexandre Bissonnette, a 27-year-old student at Laval University. Mr. Bissonnette faces six counts of first-degree murder. He was known in the city’s activist circles as a right-wing troll who frequently took anti-foreigner and anti-feminist positions and stood up for U.S. President Donald Trump. Prime Minister Justin Trudeau has called the attack an act of terrorism, but the RCMP are still weighing whether to lay formal terrorism charges. Montreal police responded to a rise in hate crimes in the 48 hours after the attack, making one arrest and receiving 29 reports of hate incidents. The mosque reopened for worship Wednesday, an emotional day for worshippers and members of the public who got to see the damage firsthand. Fox News has deleted tweets and apologized for misidentifying a Moroccan-Canadian as a suspect in the case after the network’s co-president got a strongly worded letter from Mr. Trudeau’s communications director, Kate Purchase. The tweets and other similar reports were based on erroneous early information from officials that a second suspect was involved. Witnesses interviewed by The Globe and Mail began to flesh out the timeline of what happened Sunday night at the Centre culturel islamique de Québec in Quebec City. Around 7:30 p.m., the mosque's parking lot was filling up for evening prayers. Witnesses recall the doors being opened some time between 7:30 and 7:45. By 7:50, some inside heard a commotion outside one of the entrances to the prayer room. There, Mamadou Tanou Barry and Ibrahima Barry – two distant cousins of Guinean origin – were the first ones killed by the gunman, who then went inside the room and continued shooting. The attack lasted only a few minutes. At 8:10 p.m., police received a 911 call from a man asking to speak with investigators. The unidentified caller claimed to have been involved in the shooting and told police he would wait for officers at an access road near the Île-d'Orléans bridge. At 8:55 p.m., a suspect was in custody. By 10 p.m., Quebec's Integrated National Security Enforcement Team, consisting of investigators from the RCMP, the Sûreté du Québec and the Montreal police service, had taken over the case. Prime Minister Justin Trudeau and Quebec's Premier Philippe Couillard expressed condolences and said they were co-ordinating to deal with the situation. The response of the health professionals involved in this drama, from the paramedics to the surgeons, was impressive. They really answered the call in difficult circumstances. Alexandre Bissonnette is shown in a photo from his Facebook profile page. Alexandre Bissonnette, a 27-year-old student at Laval University, grew up on a quiet crescent in the Cap-Rouge suburb of Quebec City. His acquaintances and activists in the city painted a picture of him as a right-wing troll inspired by the French extreme right who supported U.S. President Donald Trump. His online profile and school friendships revealed little interest in extremist politics until last March, when French nationalist leader Marine Le Pen visited Quebec City and inspired Mr. Bissonnette to vocal extreme online activism, according to people who clashed with him. Mr. Bissonnette has been charged with six counts of first-degree murder. All six victims were men, aged 39 to 60. Most of them had young children. Abdelkrim Hassane, 41. Mr. Hassane was a civil servant, working as an analyst-programmer for the Quebec government after a stint in IT for the provincial police. Mamadou Tanou Barry, 42, and Ibrahima Barry, 39. The two, both originally from Guinea but not related to each other, were inseparable. They were civil servants who lived on different floors of the same apartment building on La Pérade street in Sainte-Foy, a friend said. Azzeddine Soufiane, 57. Moroccan-born Mr. Soufiane came to Quebec City three decades ago as a student at Laval University, but he became known as a community pillar who was well known for being helpful to newly arrived Muslims. Khaled Belkacemi, 60. After graduating from Polytechnic School of Algiers in 1983, Prof. Belkacemi obtained his master’s degree and doctorate in chemical engineering from the Université de Sherbrooke. Aboubaker Thabti, 44. Mr. Thabti only lived five minutes from the mosque. His friends knew that he didn’t work on Sunday nights, so when they couldn’t reach him after the shooting started, they feared the worst. Leaders of the Quebec City mosque said security had been "a major, major concern" prior to the attack. The mosque has been targeted by racist and anti-immigrant vandalism in the past. Last summer, during Ramadan, a pig's head was left at the front door with a card saying "bonne appétit." Eating pork is considered haram, or forbidden, in the Islamic faith. 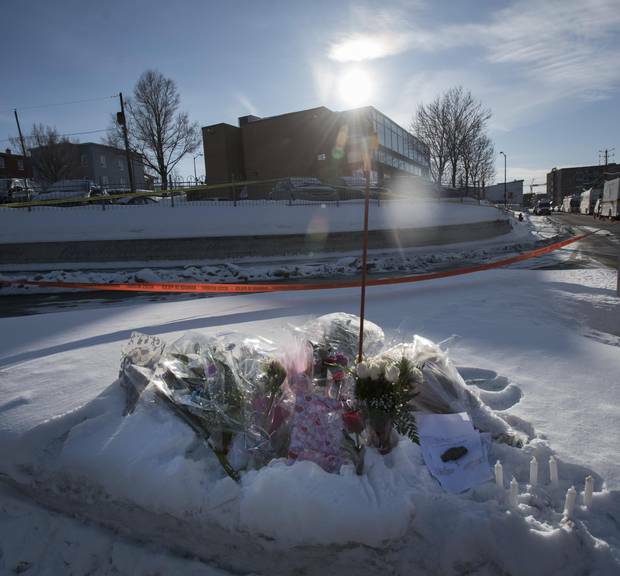 Flowers and notes are laid at a makeshft memorial near the Centre culturel islamique de Québec on Jan. 30, 2017. We are horrified by this despicable act of violence. Our prayers and deep condolences are with the families of the victims. ... This act of wanton murder must be punished to the fullest extent of the law. 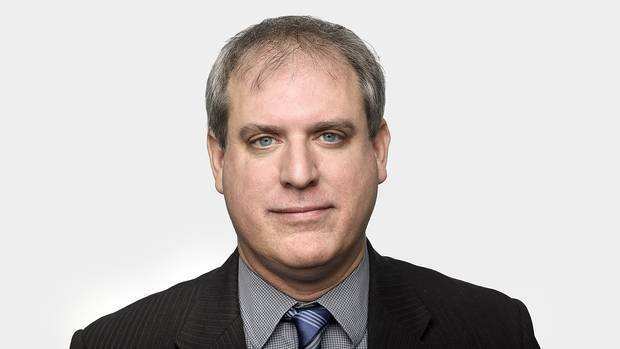 The federal government urged places of worship, schools and community centres to assess their security and seek federal assistance if they need more protection against potential hate crimes. I know who that was, and who that was. These were my friends, who I’d known for years. We wanted people to see how horrible it was. This wasn’t a movie. There were lives lost and orphans created. Sainte-Foy, a sleepy suburban community in a city with one of the country's lowest homicide rates, was shocked by Sunday night's attack. The community's Centre sportif became a hub for concerned community members to gather and exchange news about missing friends and loved ones. 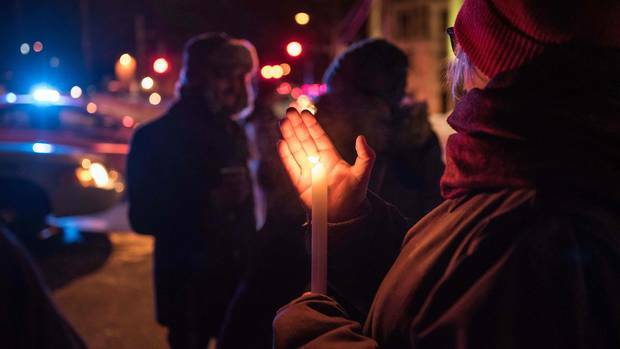 Vigils were held in Quebec City, Montreal and other Canadian cities on Monday evening. All Quebeckers are united in the solidarity we express today. Our society is a very open, tolerant and hospitable one, but we are not different from other societies, we have the same devils, xenophobia, racism...we should not be complacent in our society. Make no mistake, this was a terrorist attack. It was an attack on our most intrinsic and cherished values as Canadians: values of openness, diversity and freedom of religion. Canadians will not be intimidated, we will not meet violence with more violence. We will meet fear and hatred with love and compassion. On Thursday, thousands came to Montreal's Maurice-Richard Arena for a funeral for three of the victims. Their caskets were draped in the flags of their homelands, Tunisia and Algeria. An overall view of the funeral for Abdelkrim Hassane, Khaled Belkacemi and Aboubaker Thabti, three of the six victims of the Quebec City mosque shooting. Condolences came in on Monday from world leaders including German Chancellor Angela Merkel, French President François Hollande and Pope Francis. Je dénonce avec la plus grande fermeté l'odieux attentat qui a fait au moins six morts et de nombreux blessés dans une mosquée à Québec. 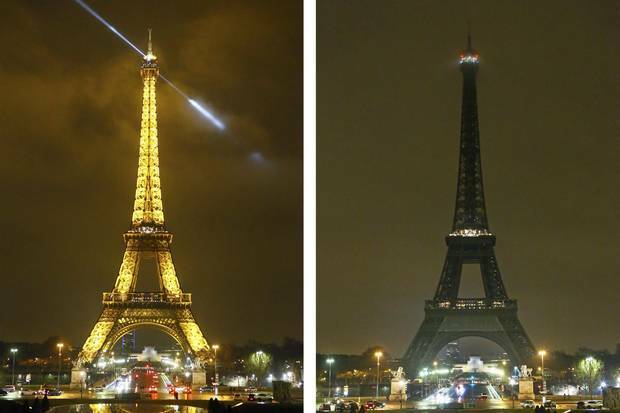 The Eiffel Tower was switched off just after midnight on Jan. 31 in memory of the victims of the attack in Quebec. In France, the shooting also got a reaction from Ms. Le Pen's far-right party, which called the mass shooting "deplorable." When asked about Mr. Bissonnette's support for Ms. Le Pen, a party spokesman said Monday the French politician should not have to apologize for comments people make on their private Facebook pages. From Washington, Mr. Trump offered his condolences in a phone call to Mr. Trudeau. But Mr. Trump's spokesman later appeared to link the incident with the U.S. immigration ban on seven Muslim-majority countries, despite the fact that the six male victims in the Quebec attack were Muslim. 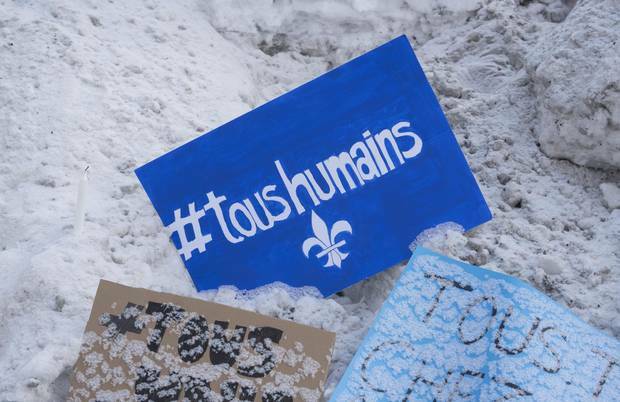 A message with the slogan “all human” and the Québécois fleur-de-lis lies near the Centre culturel Islamique de Québec on Jan. 31, 2017. The shooting has added a new, dark urgency to Canadians' conversation about racism, immigration and pluralism, with several politicians and public figures taking aim at the U.S. immigration ban and far-right politics in Europe. We’ve breached a barrier that we never thought would happen in Quebec. Someone fuelled by hate shot several people. Will this act lead to some kind of collective looking-out for one another? I wish it would. But my fear is that we’ll fall into the same identity politics and divisions we’ve seen in the past. 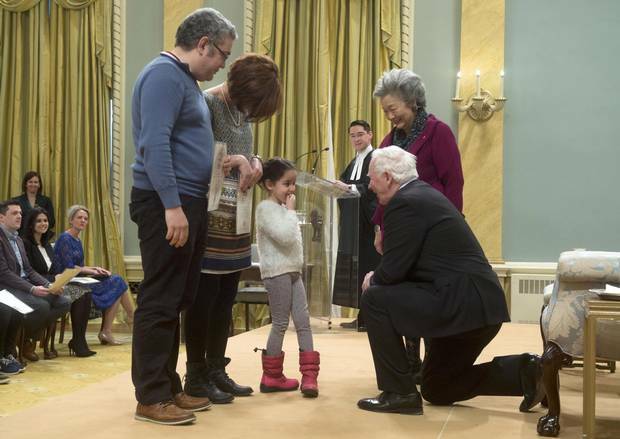 Former governor-general Adrienne Clarkson, right, Razik Mammeri, left, and Fairouz Djafri look on as Governor-General David Johnston kneels to speak with Yasmine Mammeri after presenting them with Canadian citizenship certificates at Rideau Hall on Jan. 31, 2017. We hear people who want leadership and who become leaders referring to an entire nation, who is their neighbour, as rapists, criminals. We hear the calumny. We are appalled. But the words have been said. And the words have been heard. 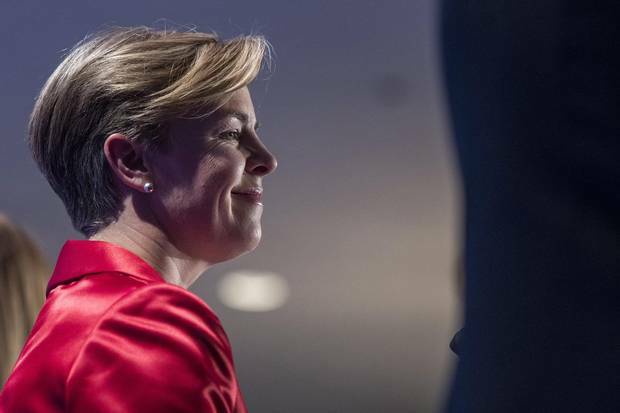 Conservative leadership candidate Kellie Leitch listens during the Conservative leadership debate in Saskatoon on Nov. 9, 2016. Heartbreaking news out of Quebec City tonight. My thoughts and prayers are with the victims. Conservative leadership candidate Michael Chong has directly linked the Quebec attack to the political climate surrounding immigration, pointing to the U.S. immigration plan and accusing politicians of normalizing hate speech. Another leadership candidate, Kevin O'Leary, got in hot water for posting a video of himself firing high-powered weapons at a Miami gun range. It was posted just as the Thursday funeral for three of the victims was under way. Hours later, Mr. O'Leary tweeted that he had taken the video down out of respect. Public Safety Minister Ralph Goodale, meanwhile, called the timing of the video "obviously crass, insensitive and exceedingly dumb." Out of respect for today’s service I have taken down my last post. 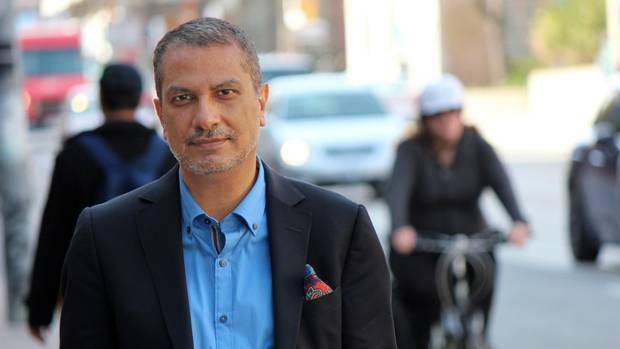 Kamal Al-Solaylee: In culture of hate toward Muslims, don’t forget made-in-Canada contributions For those of us who identify as Muslim, Sunday’s attack challenges what we believe and love about Canada – its acceptance and diversity – and confirms a disturbing undercurrent we’ve suspected all along. 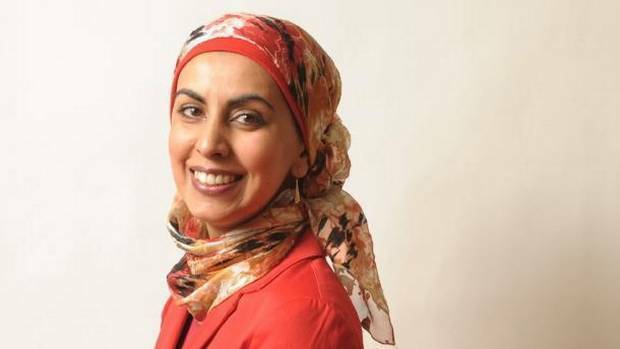 Zarqa Nawaz: My Canadian sanctuary: What the mosque means to me I never imagined a day would come when I would look at my mosque and wonder if it was safe to go inside. I need my mosque to go back to what it was before the Quebec shootings, a place where my community and I organize, cajole and negotiate with one another despite the differences of our skin colours, religious outlooks and heat tolerance. 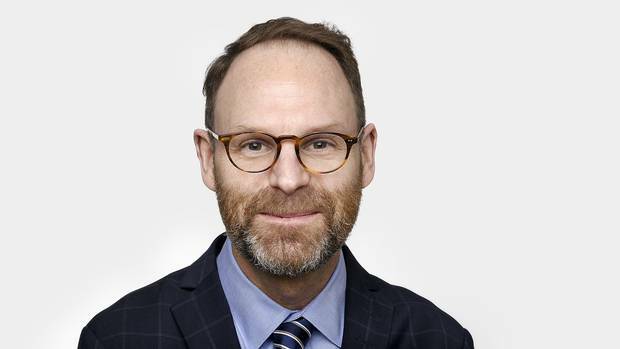 Konrad Yakabuski: A mosque shooting Quebeckers must never forget the attack on a mosque in a sleepy and snowbound Quebec City suburb has profoundly shaken the whole country. But its repercussions will be felt in Quebec to a degree few Canadians outside the province can fathom. The shooting could have happened anywhere. But because it happened in Quebec, its aftermath will be as distinct as the society in which it occurred. Campbell Clark: Trudeau’s homily demands a call for healing This was, Mr. Trudeau emphasized, an act of terrorism. But the language that he used in addressing the Commons on Monday afternoon wasn’t what we’re used to hearing from leaders after a terrorist act. There was little talk of vigilance, or rooting out evildoers, or new intelligence measures, or fight. Editorial: An attack on Canadian Muslims is an attack on Canada An attack on any Canadian, simply for exercising their constitutional right to live according to the dictates of their conscience, or because they trace their ancestry to one part of the world and not another, is an attack on all Canadians. 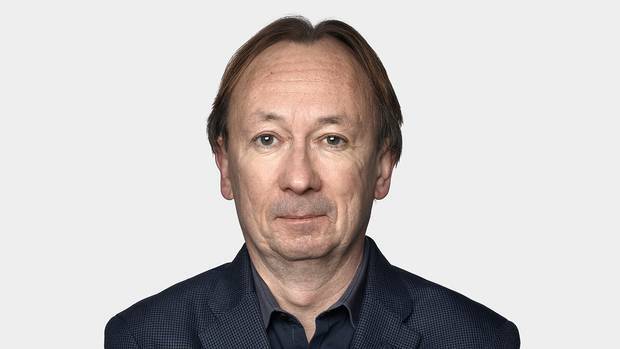 John Doyle: Lack of TV news coverage of Quebec City shooting a huge broadcast failure On Sunday night, mind you, for many hours, information in English Canada about the mass shooting at a mosque in Quebec City was confined to a handful of online sources. English-language Canadian TV news was nowhere to be found. It was a catastrophic broadcast failure and, in particular, a disgraceful showing by CBC-TV news.